Simple to use. Just cut off both ends of the pineapple, put it under the pusher and pull down. 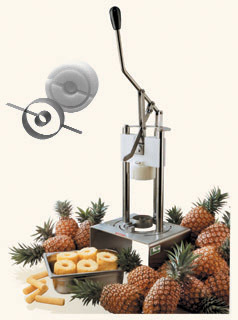 It cores and peels at the same time, giving you a perfectly peeled pineapple every time. Includes either 3", 3 1/2" or 4" coring & peeling blade and pusher.